EBAYC envisions a future where all young people grow up to be lifelong builders of a just and compassionate multicultural society. Our mission is to support all youth to be safe, smart, and socially responsible. We believe that if we partner with public and private institutions to provide young people with a continuum of high-quality support and opportunities and if we engage families to actively participate in the public arena to improve the quality of neighborhood life, then our young people will be safe, smart, and socially responsible. 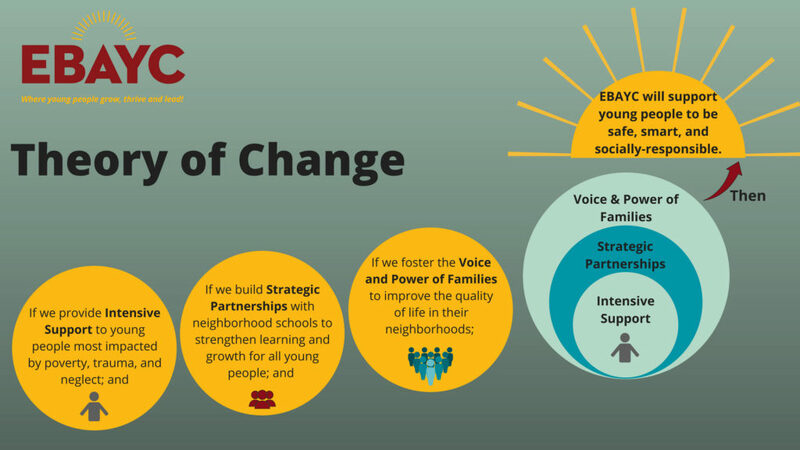 Thus, EBAYC builds strategic partnerships with schools, city and county governments, and community organizations, and establishes trusting relationships with families to provide seamless services to support youth. Our diverse menu of services include youth violence prevention, expanded learning, and civic and community engagement.